 Nollman (Spiritual Ecology, not reviewed) offers provocative reflections on the need to create a sense of place--``a bit of paradise within an imperfect world.'' Nollman offers an eclectic month-by-month record of his gardening experiences. For this ex-hippie, who admits he came to gardening with many fixed ideas and prejudices that he has since abandoned or modified, a garden is a place where a genuine healing relationship between person and place can be formed. Asserting that that ``we, the increasingly rootless species, must learn to root...must learn to nurture the ground that sustains us,'' he demonstrates how this can be done. In essays that reflect the changing seasons in his own island garden in Puget Sound, Wash., Nollman discusses attitudes to nature that have led to widespread environmental damage; the need for a middle ground between ecology ideologues and ordinary farmers; and the indivisibility of all life forms. The progress of a sequoia tree he plants near a pond in his ``one-tree garden'' provides a common thread for both his practical comments and his philosophy. 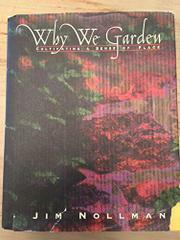 The broader topics are illustrated by examples from his garden: In ``March: The Soil Garden'' he gives a history of soil and shares his techniques for creating a nutrient- rich soil; in ``June: The Semi-Real Garden'' he ponders the effects of plant hybridization and his affection for a double peony that ``epitomizes all the excess of the semi-real flower world''; and in ``October: The Weed Garden'' he suggests alternatives to herbicides for resolving weeding problems while noting that weeds are ``simply those unintended plants able to thrive and heal broken ground.'' Like the best gardeners, Nollman knows that gardening is as much about living as it is about growing the perfect rose. A gardening book refreshingly rooted in reality that is also balm for the spirit.